Bayern Brewing firmly believe in sustainable business practices and environmental responsibility. It just makes sense. This section of the website shares our efforts to lower the brewery’s impact on the environment, creating quality beer while preserving natural resources. 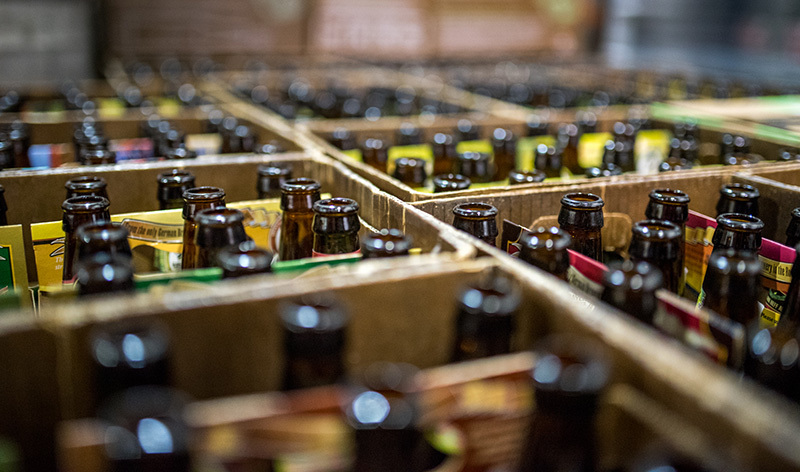 For several years now, Bayern has been buying back our 6-pack holders and/or giving recyclers trade-in value for beer or merchandise in the Tasting Room. In Spring 2010 Bayern took this a step further and began recycling its own glass, making it the first brewery in Montana, and one of the few in the nation, that recycles (or reuses) its entire packaging material. Now, participants can use a Bayern Ecopack to recycle their glass and get a refund for bottles returned to the brewery (see Eco League for details). The aim is to keep as much of the brewery’s packaging out of the landfill as possible, but reusing our bottles and 6-pack carriers (as much as possible) just makes good business sense too. Bayern is proud to be able to reuse glass bottles, but we need your help. By participating in the Bayern EcoLeague, you can give those empty bottles a new life. For a one time $3 deposit you get a Bayern Ecopack. The purpose of this wax box is that it is fitted to our machine and makes transporting bottles in and out safer. Fill the Ecopack with 24 bottles in 4 carriers and we give $.05 cents credit for the bottles that qualify and if you have our 6-pack holders that are in reusable shape (not left out in the weather) we give you $.10 for those. Exchange for an empty Ecopack each time you drop off a full pack at Bayern Brewing. If you have any questions or concerns bring the bottle/s into the taproom and we can help you with your questions. You can also contact the taproom at 406-721-1482. Good beer starts with good water. In Missoula, Montana, we are very fortunate to have some of the best-quality water in the entire nation just below our feet. The Missoula Aquifer is fed by 4 major waterways and other runoff from the beautiful mountains that surround the Missoula Valley. To contribute towards preservation of this resource, and to celebrate the angling/river sport culture of our area, Bayern teamed up with Montana Trout Unlimited, naming Dancing Trout as the official beer of this non-profit organization. A percentage of all Dancing Trout merchandise and beer sales goes directly toward Montana Trout Unlimited and their efforts to conserve and restore Montana’s coldwater fisheries, riparian areas and watersheds. Another key ingredient in beer is malted barley (and occasionally wheat). After these malted grains have been used to create beer, although much of the starches have been removed, most of the protein (and fiber) is still present. That is why breweries have been offering their "spent grains" for use as feed for livestock for as long as commercial brewing has existed. The spent grain at Bayern Brewing goes to a family-owned ranch in the Frenchtown area, where the cows come running when they see the truck full of this tasty meal!